Escape the bustle of city life in this elegant spa with shimmering décor and gorgeous lighting. 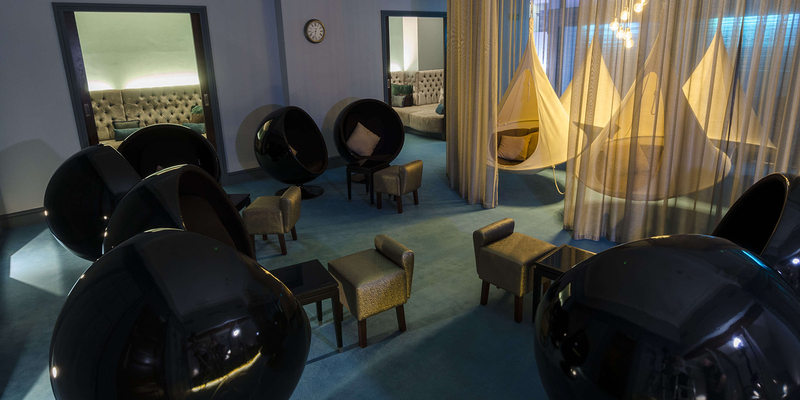 The highlight of The Spa at The Midland is the sumptuous relaxation room with four hanging pods, soft cocooning chairs, armchairs and three beds with duvets and pillows – perfect after your soothing ESPA treatments or more dramatic 3D Skintech facials. 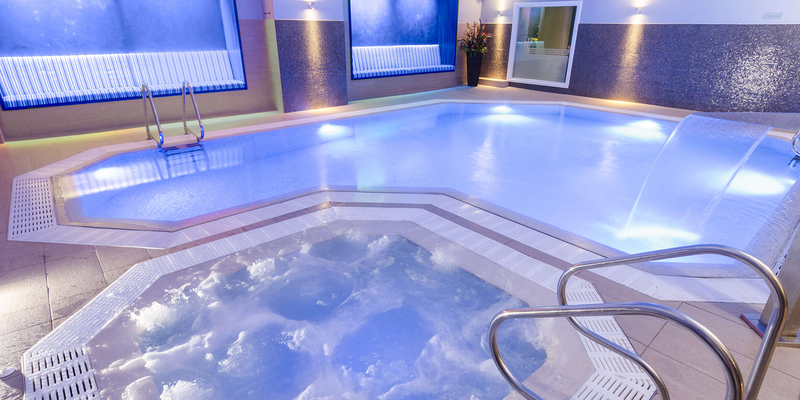 The wet facilities include a 9-metre relaxation pool, hot tub, alderwood sauna and steam room. Great for couples, friends and lucky locals. 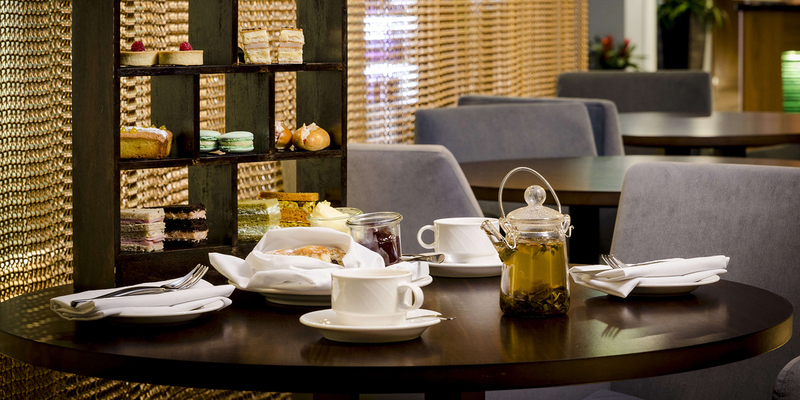 The four-star Midland Hotel is an iconic red-brick building in the heart of Manchester. Doormen in top hats and tails have opened the doors to royalty, political leaders, sportspeople and rock stars. 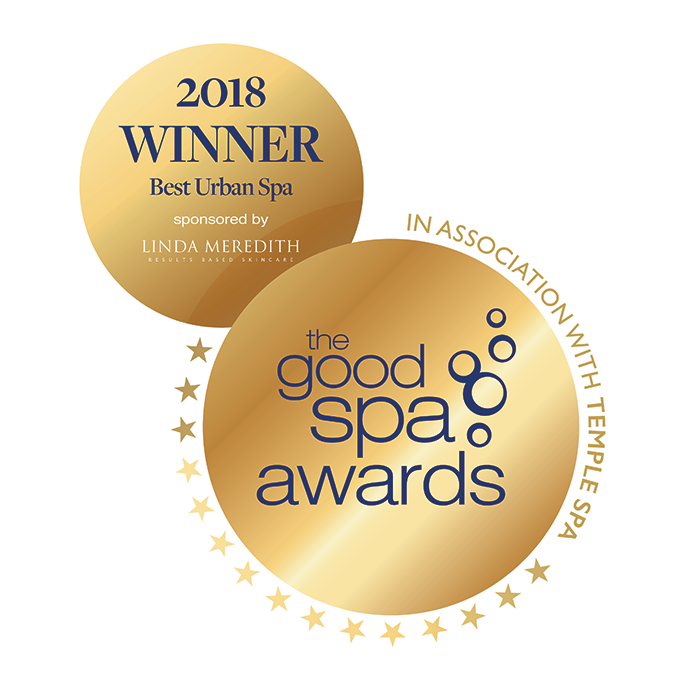 After a multi-million-pound refurbishment in 2015, the historic hotel introduced The Spa at the Midland, two critically acclaimed restaurants, and the award-winning Tea Room. Take the lifts at the back of the lobby to the spa and gym in the basement. The hustle and bustle of the hotel gives way to an elegant spa which shimmers in tones of honey, dark wood and grey. Staff warmly greeted us in the spa's Art Deco reception area and invited us to take a seat on a soft sofa to complete our consultation form. The well-equipped changing rooms have high ceilings with original cornices, bench seating, and rows of dark-wood lockers in which you will find your grey robe, slippers and not one but two towels (thank you, The Midland). There are two vanity stations in the centre of the room with hairdryers and straighteners; three showers with shampoo, conditioner and shower gel; two loos; and two private changing cubicles. The changing area feels surprisingly spacious for an urban spa. The wet facilities are just across the corridor from the changing area. We began with a few gentle lengths in the nine-metre, L-shaped pool which we had to ourselves. Use the powerful swan-neck fountain afterwards or climb into the bubbly Jacuzzi in the corner with seating for half a dozen people. The salt-infused aromatherapy steam room could have been a little more steamy. We loved the Himalayan salt sauna, though, with its wall of salt bricks in shades of orange, gold and red. At 85 degrees, this one was definitely toasty; we cooled off in the experience showers afterwards, selecting "Arctic Rain" for a blast of cold water. There's also a stylish copper sink with cool water and plastic cups beside it so you can stay hydrated. The centrepiece of The Spa at The Midland is the relaxation room. The large space is dimly lit and well separated so you won't be immediately facing another guest. There are four hanging pods in the centre of the room, trendy egg chairs, and traditional armchairs. Two seating areas can be completely closed off from the rest of the relaxation room, with three beds covered in duvets and pillows, each with individual reading lights. Help yourself to water, teas and magazines, too. Feeling energised? Use the spa's well-equipped gym located next to reception. We tried the Signature Serene Sleep with hand and foot massage (85 minutes, £110), an ESPA treatment designed especially for The Midland to encourage a better night's sleep. My therapist, Valeria, met me in reception and led me to a spacious treatment room with high ceilings, dark wood counters and turquoise accents. She dabbed scented oil on the back of each hand and asked me to choose; I was drawn to the "restorative" with sweet notes of orange and lavender. I removed my robe and settled face down on the warm treatment bed. Valeria used my chosen oil and hot stones to massage my back in soothing circular movements. She also massaged my arms, stretching them out in front of me, then placing them back by my sides with a hot stone in each palm. The stones felt warm, smooth and soothing on my skin. Valeria asked me to turn over and began the facial element of the treatment. She used a cleansing milk to clean my skin, followed by a light Hydrating Floral Spafresh toner which smelled light and summery. For the facial massage, Valeria used warm rose-quartz crystals which felt extremely comforting. Valeria applied a rich hydrating Overnight Hydration Therapy mask. While it set, she massaged my neck, scalp and shoulders, working hard to reduce the many knots that have set up camp there. Valeria removed the mask, cleansed my face again and applied a hydrating moisturiser. The treatment ended with a sublime foot and hand massage. On inspection, my face had a younger, healthy glow and my knotty shoulders felt much softer. By the morning, the tenderness in my shoulder from carrying a heavy bag had completely gone, while my skin still looked brighter and more plumped. Valeria's after-care advice was both thorough and informative. 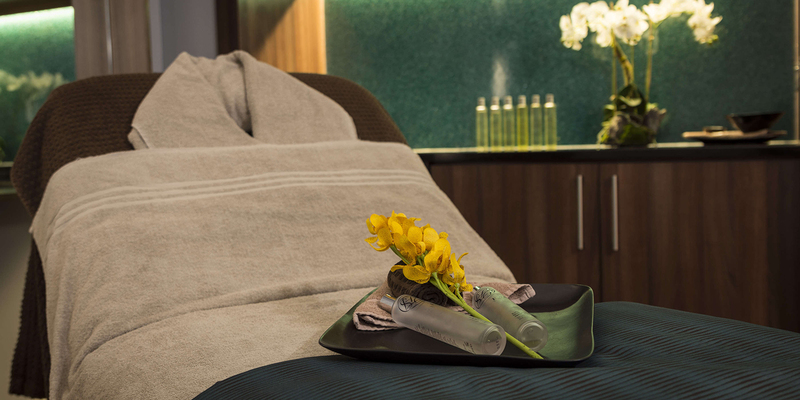 The Spa at The Midland offers ESPA facials, massages, and body treatments such as scrubs and wraps. Try the rasul, express 25-minute treatments or more holistic options such as reflexology. If you like your facials with more dramatic results, the 3D Skintech facials use microdermabrasion, light therapy and mesotherapy to lift and plump. You can eat lunch in your robe at the tables alongside the spa reception desk; they're separated from the walkway by a chain-effect dividing wall. 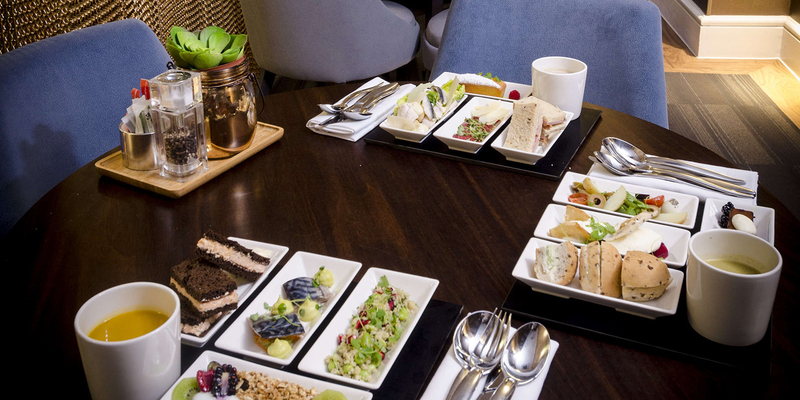 Choose from a menu that includes light sandwiches or healthy platters. Our superfood platter was like three courses on one plate: sweet potato soup, salmon sandwiches without the crusts, a side salad of mackerel and wasabi, and Greek yoghurt with fruit and granola. Yummy and healthy. What's not to love? If you're staying overnight, dine in the quirky Mr Cooper's House & Garden restaurant which has a tree in the centre and garden-style seating around the edge. Our dinner was outstanding, from the Limousin burger with charcoal mayonnaise, smoked applewood and skin-on fries, to the crisp white wine. Having the whole pool to ourselves: We felt like it had been reserved just for us. The stylish design: We loved the original Art Deco design throughout the property; it is truly stunning. The delicious food: Everything from our lunch to our dinner was fantastic. More hooks for towels and robes in, or just outside, the spacious showers would be a good addition. The spa slippers: Flip-flops, please. We don't love soggy feet. Who do you think would like it? Single spa-goers: The Spa at The Midland feels friendly and intimate enough to go solo. 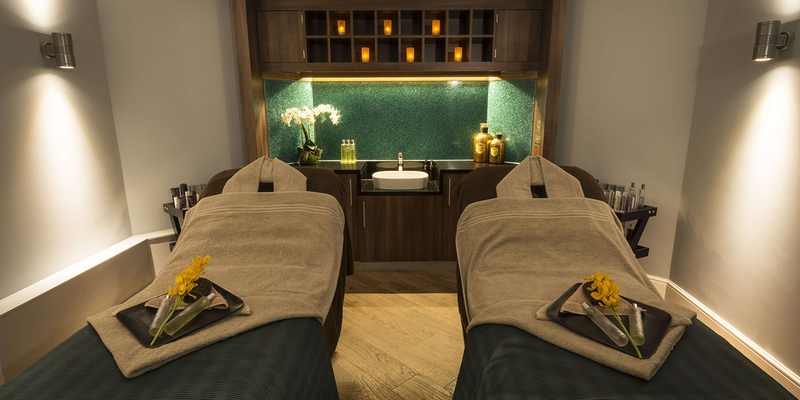 Couples: Book a dual treatment suite to spa alongside each other. City slickers: The central location and express treatments lend themselves to a post-work treat. What bubble rating did you give this spa? We awarded The Spa at The Midland a Good Spa Guide Bubble Rating of 5 Bubbles. The friendly staff, unusual treatments and great food make for an indulgent spa day. 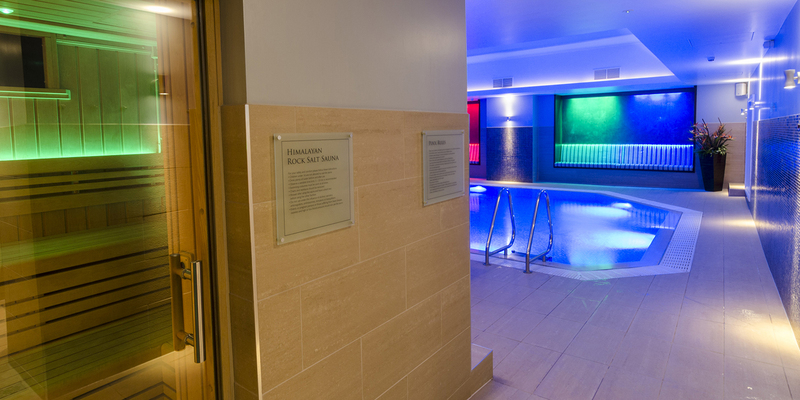 The pool and thermal facilities are a decent size for a city-centre hotel, and the relaxation room is pure spa bliss. Stylish Spy visited in September 2018 and awarded it 5 Bubbles. I would like Good Spa Guide to pass on my email address to the spa so they can connect me directly about my comment. "Lovely welcome and great customer service. Excellent food options that are delicious. Beautiful treatments and great relaxation areas. You’d never know you were in the middle of Manchester! I’ve been to several spas and this is my favourite. Local too!" "This is one of the most beautiful spas I’ve been to. A wonderful selection of treatments and the relaxation room is just a special place. I didn’t want to leave!! " "I was fortunate to win a Spa day with treatments at the Midland. It was perfect. The treatments - I chose a facial and Back Neck & Shoulder massage were amazingly relaxing and SO good. I felt the benefit for days. I would hugely recommend and this will be my number one go to spa. " "I visited The Spa at the Midland in November 2015 for my birthday and I absolutely loved my experience. I spent the whole of my last day in Manchester at the Spa and I can say that without a doubt, I would love to go back just for the spa! With the vast variety of facilities and relaxation rooms, (including the amazing shower experience) there was more than enough to keep me occupied as a solo spa-goer, not to mention the amazing massage which almost sent me to sleep! I tucked into an afternoon tea (which was more than enough for just one person) and was given much attention from the moment I arrived. The showers and changing rooms were sleek, clean and modern which also added to the experience at the end of the day." The Midland offers two critically acclaimed restaurants, an award-winning Tea Room and Mr Coopers'. Every spa day package includes full use of the thermal suite and poolside areas and a light lunch or afternoon tea served in the comfort of your robes in the spa café. The Spa is open to those aged over 18. Access to the thermal areas and gym is not permitted for guests under the age of 18. Children under 18 who are residents in the hotel have access to the pool between 7:30am - 9:00am and 5:30pm - 7:00pm (6:30pm Saturday - Sunday). Children must be accompanied by an adult/s. Ratio 1 adult per 2 children. Please inform us as early as possible of any medical matters as pregnancy, certain medical conditions or injuries may prevent the use of some facilities and treatments. Superior Rooms are an obligatory upgrade for guests seeking increased comfort and indulgence. Upgrade for just £30 per room, per night. The Junior Suites offer separate lounge and bedroom areas guaranteeing you plenty of room in which to relax and unwind. Upgrade for just £75 per room, per night. The 7 Midland Suites offer grand, luxurious living spaces with extravagant furnishings and towering views of the city. Midland Suites are replete with additional extras, ensuring the highest pinnacle of indulgence is always accounted for. The leisure facilities are open Monday to Friday: 6.30am-9pm and Saturday and Sunday: 7am-7pm. The spa facilities are open Monday to Thursday: 9am-8pm; Friday: 9am-7pm; Saturday: 8am-6pm; Sunday: 10am-6pm. The nearest train stations to the hotel are Manchester Oxford Road (200 metres) and Manchester Piccadilly (¾ mile). For train times and journey planning please visit nationalrail.co.uk. The main station for nationwide services is Manchester Piccadilly, which is linked to the hotel by the Metrolink Network (on the Eccles, Altrincham, Manchester Airport and East Didsbury lines, alighting at St Peter's Square) and by the Metroshuttle Free Bus Route. The Metrolink network runs across the City Centre and Greater Manchester. The nearest stop to The Midland is St Peter's Square to the side of the hotel, with services including those to and from Manchester Piccadilly, Manchester Victoria and Manchester International Airport. For timetables and journey planning please visit metrolink.co.uk. Manchester is serviced by a free Metroshuttle bus which links the main train stations, car parks, shopping areas and hotel around the city centre running at least every ten minutes, the nearest stop is outside the Free Trade Hall, 150 metres from the front of the hotel. For a route map and timetable please visit tfgm.com/metroshuttle. Visit ncp.co.uk for tariffs and more information. Valet parking is also available via the hotel Concierge at a charge of £30.00 per 24 hours. Manchester International airport is the nearest Airport to The Midland (10 miles). It is connected to the City Centre by rail to Manchester Piccadilly and Manchester Oxford Road Stations, and by Metrolink to the St Peter's Square stop to the side of the hotel. The sat nav address to The Midland is 16 Peter Street, Manchester, M60 2DS, for help call the hotel on 0161 236 3333. Concierge will be available to valet park your vehicle. If you need assistance with luggage or equipment the front of house team are on duty 24 hours. There is a reception desk for guests who arrive in wheelchairs and our Reception team will make this facility available as required. You will be offered a personal check-in service with a full explanation of the hotel's facilities together with a familiarisation tour if required. Reception staff will also brief you on our evacuation policy. The Midland has 10 purpose built disabled rooms situated on the first, second and third floors. If you would like to specifically book, please contact their UK call centre on 0161 774 7051 or for Spabreaks call 0161 932 4095. The Spa at The Midland is located on the Lower Ground Floor and can be accessed via the elevators from all floors. The facilities are set over one level. Accessible lockers for guests using wheelchairs are provided, as well as accessible WC and shower. The upper level of the gym has ramped access to exercise machines, free weights and hand bike. DDA approved workout plans have been tailored to the facilities and are available from the spa reception.